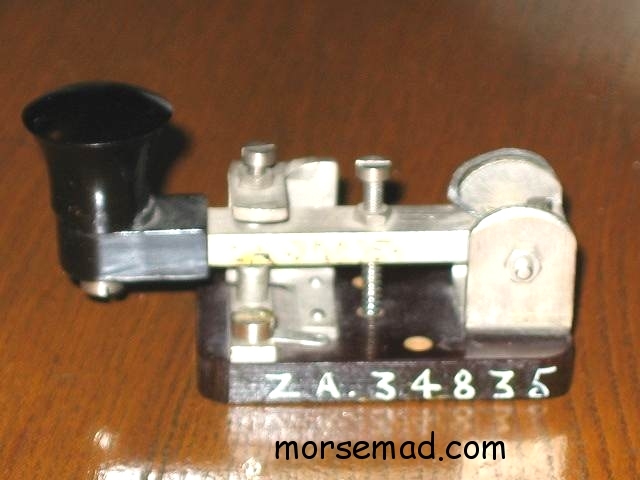 SOE Agents Spy Set morse code transmitting Key S81/2R. 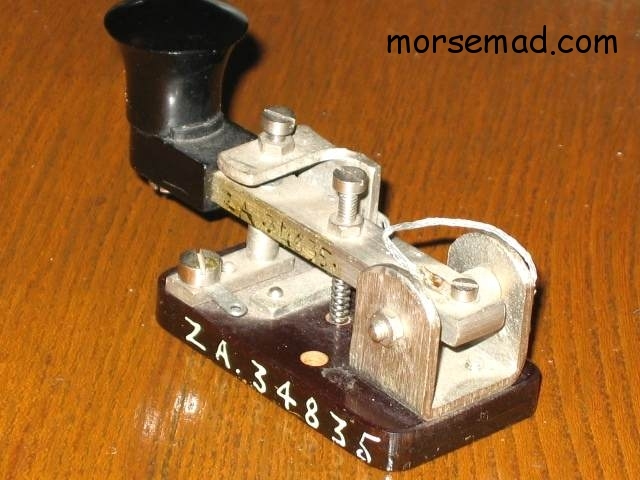 This is an original model of a small spy set morse code transmitting key S81/2R, and was used in the British spy sets A MK III and B2 Suitcase sets in the early 1940's. Later they were in Remote Control Unit L No.2 that was used with Wireless Sets No.62 and C12 from the late 1940's to the 1960's.The key and spy sets were designed by the late John Brown. This much sought after early one has S81/2R impressed into the top of the bakalite base. They are very small and light-weight keys measuring just 2" x 1.25" (50mm x 30mm). [See ref: MM22, page 11]. 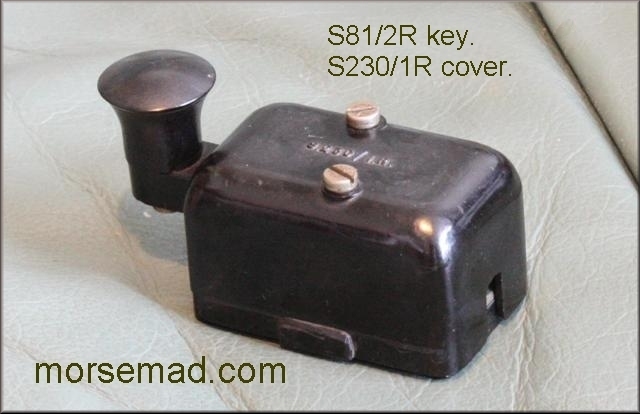 This example S81/2R key is shown with its original bakelite cover S230/1R (S.230 / 1.R). 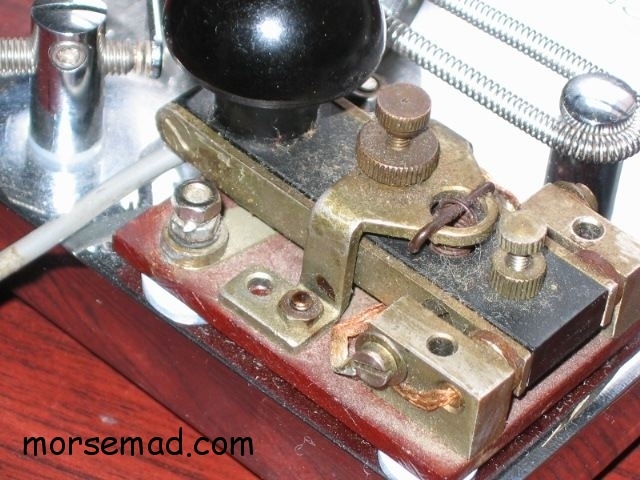 The key is shown clipped onto the metal accessory compartment lid of a spy set radio. It would then be unclipped and stored under the lid. The black crackle painted accessories compartment lid measures 6 & 1/2" by 2 & 1/2" (165mm x 63mm) and 1/16" thick with 1/8" thick felt on the underside. Both the bakelite cover and the compartment lid are rare items. Not sure what spy set radio this compartment cover belongs to - please let me know if you recognise it. Duxford Radio Society. Imperial War Museum. Eagle eyed collectors among you will notice that the B2 spy keys (as above) has its bracket with gap adjuster on the right as you look at the key while operating. The post WW2 ones have this bracket on the left. A great way to "Spot the Difference". 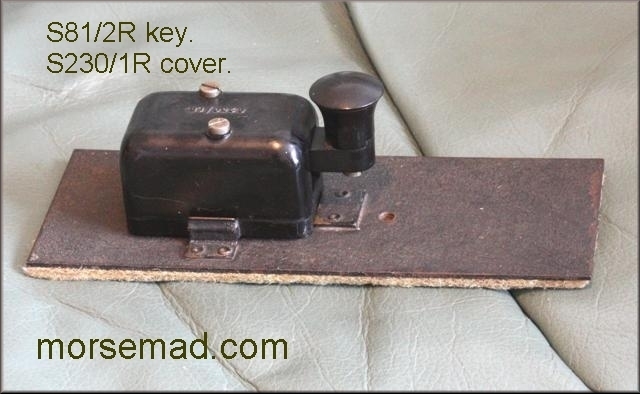 This is a slightly later model key probably used in a Remote Control Unit L No.2 that was used with Wireless Sets No.62 and C12 from the late 1940's to the 1960's. ZA 34835 is printed on the side of the base. 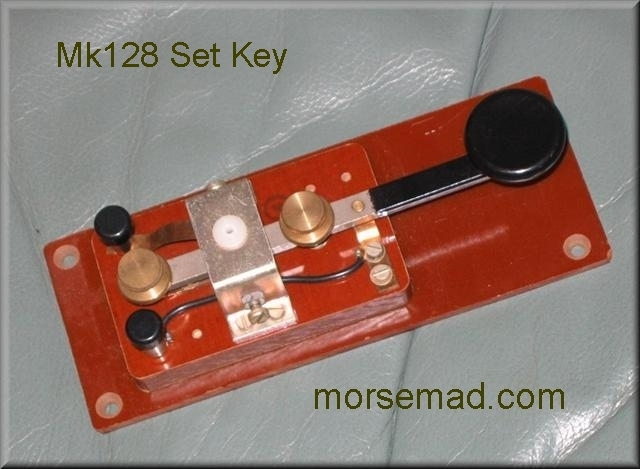 Key Used With The Mk.128 Set. 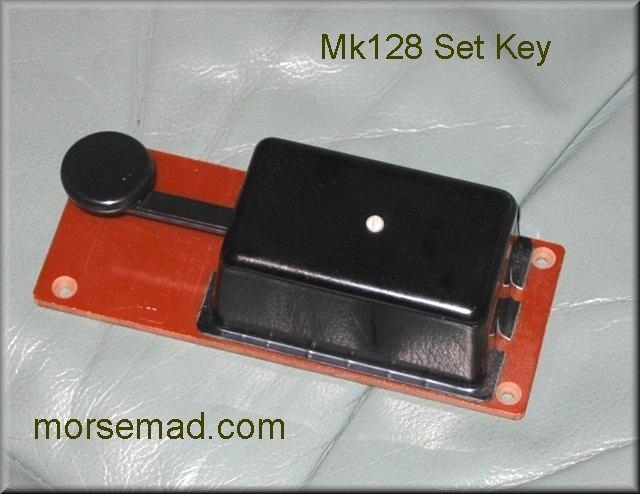 "Mk.128 Key". This fine key measures overall 6 & 1/4" x 2 & 1/2" (160mm x 64mm). 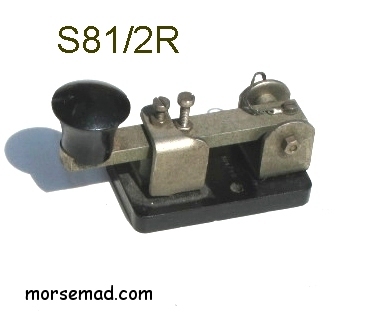 It was supplied with the Radio set Mk.128 / SR.128. It has a very smooth and quiet action. 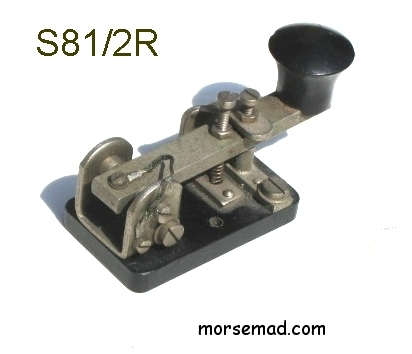 The SR128 set was used by the SAS in the 1950's. Pictured in Morsum Magnificat Nr 44, page 48. 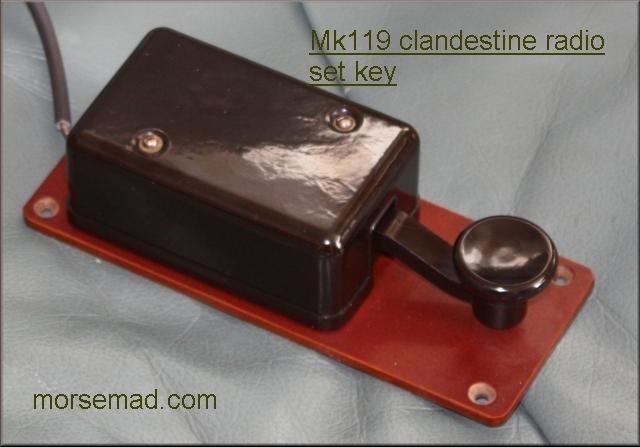 Key Used With The Mk.119 Clandestine Transceiver. 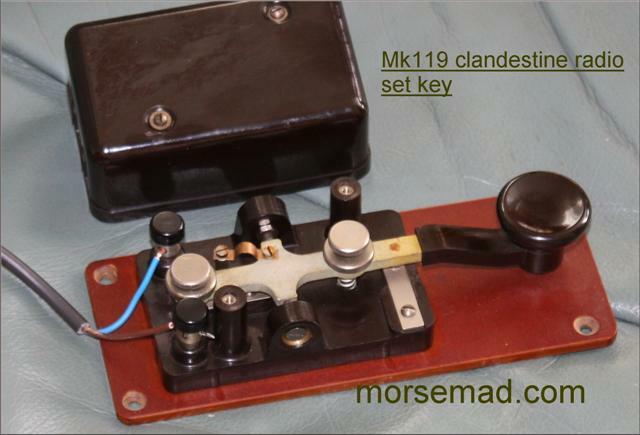 "Mk.119 Key". This magnificent key measures overall 6 & 1/4" x 2 & 1/2" (160mm x 64mm). It was supplied with the Radio set Mk.119 circa late 1940's. Another key with a very smooth and quiet action, and fitted with a smart moulded cover. Not A Spy Set Key. But Very Nice Anyway ! "YA1860". This little key is only about 2" x 1.5" and often mistaken for a spy key. 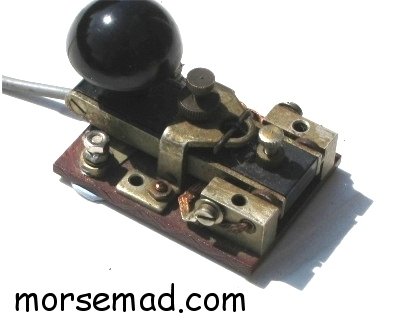 But they were used in military field telegraph/telephone sets.